Grass can make-or-break a beautiful landscape! We include two free applications of starter fertilizer with most hydroseed applications to get your new lawn off to the right start! 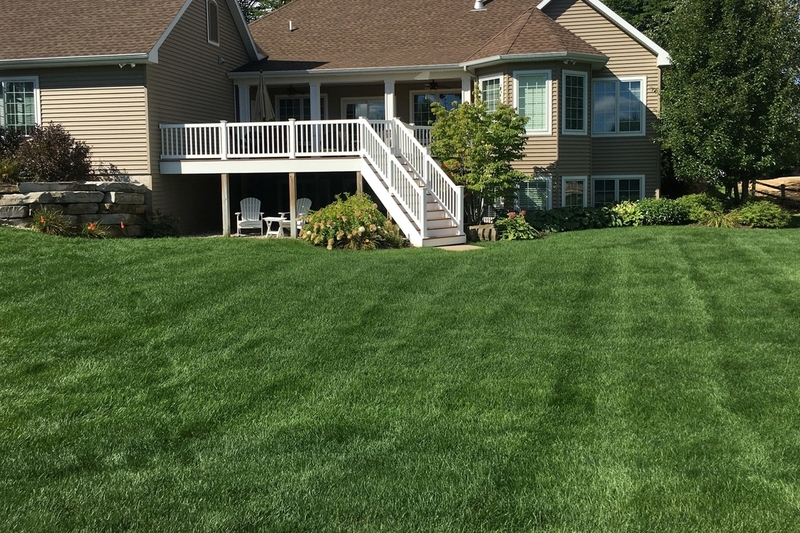 Hydroseeding creates a lush, green lawn that will make your West Michigan home the envy of your neighbors. A complete package that includes everything shown here. Make your lawn the envy of your new neighborhood! customized for your front yard. * Package based on an 8,000 – 10,000 sq. ft. yard. Your new lawn will be guaranteed until your first mow. Some restrictions may apply. A great lawn is the perfect complement to your landscaping. Our seed blend contains a high percentage of Kentucky blue grass and perennial rye grass varieties that provide exceptional turf quality, disease resistance and color. 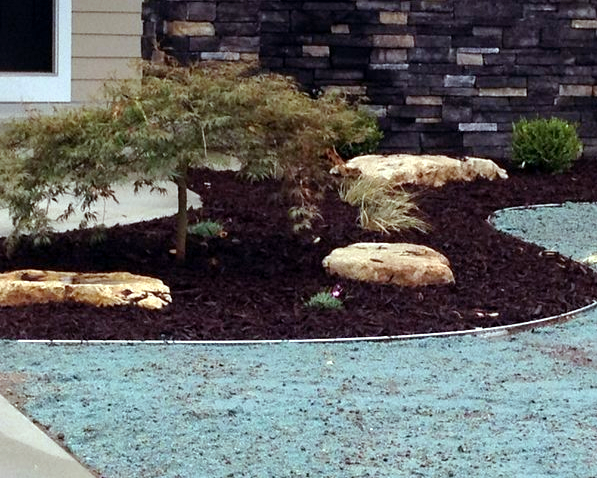 Hydro-seed in the most basic form is a mixture of mulch, seed, fertilizer and water. 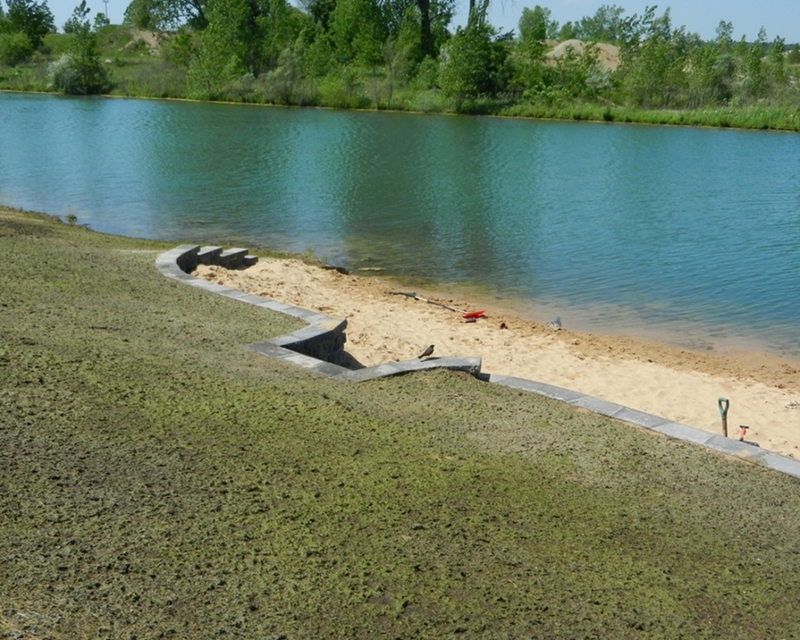 Additives such as tack, dye, and pre-emergent weed control can be added to increase the effectiveness and appearance of the hydroseed. 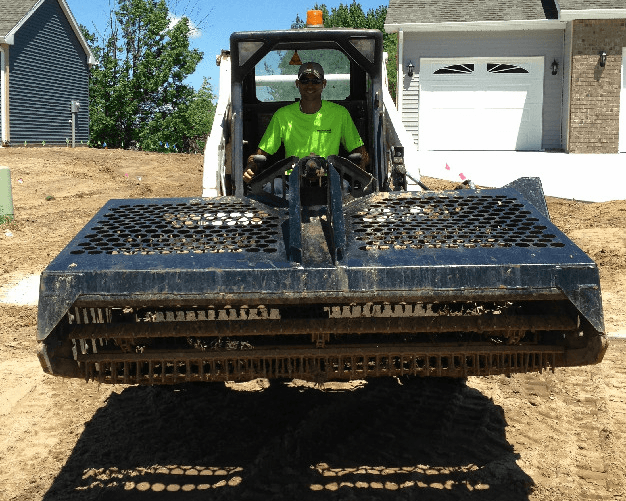 A hydroseed application begins with prepping the soil, often using heavy equipment to create the seed bed while leveling and removing any unwanted debris. A hand rake is often used to fine-tune delicate areas along concrete, edging, and trees. Once the yard has been prepped, it is time to install the lawn. The slurry of seed, fertilizer and water is mixed and agitated in a large tank and then sprayed onto the prepped soil. Hydroseeding your lawn is a fast, effective, affordable way to get a gorgeous lawn, with minimal effort. It is cheaper than sod, and much for efficient than old-fashioned seeding. Hydroseed lawns grow better and last longer! We have applied a premium seed and mulch mixture, but the care you provide is essential to the success of your new lawn. Follow these basic instructions, using your good judgement, and you will enjoy the reward of a beautiful lawn! Nothing is more important right now than watering on a regular basis! But before you begin this regimen, please allow the hydro-seed to dry (this can take anywhere from 2-24 hours depending on weather conditions). Once the mulch has dried, you can begin on a watering schedule. We recommend watering each section with sprinklers for 15 minutes three times a day. This standard may vary depending on your soil type and the current weather patterns (i.e. rain, wind, dry conditions, humidity, etc). Do not attempt to water your lawn using a hand held hose. This will not distribute enough water to the areas needed. Also, avoid over watering, as that will cause pooling, runoff or ruts in the lawn. Keep up this schedule for approximately three weeks for the best results. Note that sandy soils absorb water rapidly and dry out very quickly. Clay soils absorb water slowly and retain the moisture longer. Adjust your watering to accommodate these soil types. Keep watering regularly! The immediate growth you will see is ryegrass; bluegrass is a slower growing grass and will take longer to establish. If you have any questions, please do not hesitate to call our office! We have included a quality starter fertilizer with the hydro-mulch to provide the new seedlings the necessary nutrients for growth. A starter fertilizer is recommended in approximately 3-4 weeks from the original date of installation. Your lawn will continue to need fertilization at regular 3-4 week intervals for the first growing season. After one growing season, it is important to continue with a regular fertilizer, crabgrass and weed control program in order to achieve optimum results. Mow the grass once it has reached 1.5” in height. Temporarily lower your mower deck to maintain a 1-1.25” cutting height. This will encourage the slow-growing bluegrass to take over and thicken the lawn. Maintain this cutting height for 2-3 months. As the lawn is established, mow regularly at a height of 2.5-3”. Cutting the grass any shorter is damaging the lawn. As a rule of thumb, never take off more than 1/3rd of the grass blade when mowing. Always keep your mower blades sharp to ensure a clean cut, uniform color and a thicker lawn. 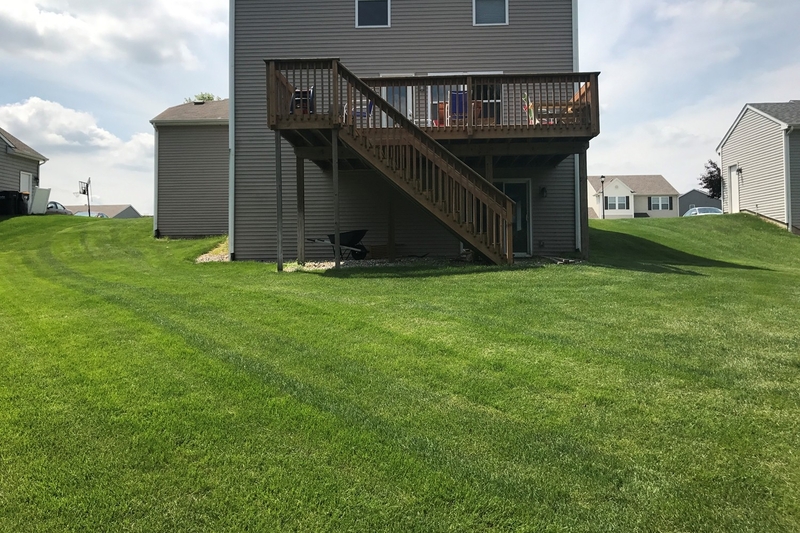 It is inevitable that you will have weeds in your new lawn. Weed seeds are in the existing soil and are also spread by wind currents. Don’t worry though, most weeds are easily controlled. The best way to eliminate competition from weeds is to keep the cut short. Do not let the weeds grow up higher than 1-2”. Once that lawn has matured (after about 5-6 regular cuttings) the grass can withstand a weed control application. If you are signed up for our fertilizer program, you will receive a weed control application according to when the lawn was seeded. The weed control we apply will kill any broadleaf weeds in the lawn, but will not take care of existing crabgrass. The existing crabgrass will die off with the first frost. 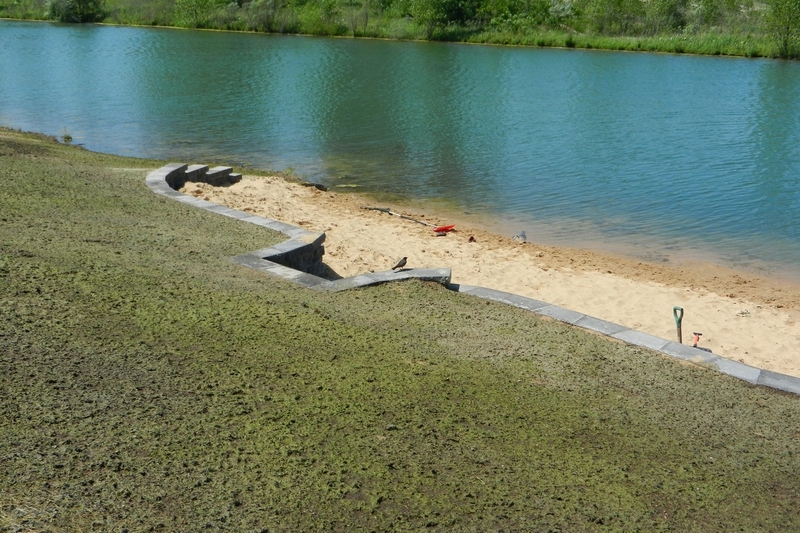 We use the best materials available with professional and proven methods for hydroseeding your lawn. Once the lawn is seeded, it is your responsibility to provide the proper care and maintenance. Prow-Mow cannot guarantee the results of your lawn because of the care you provide as well as weather conditions are beyond our control. We cannot be responsible for acts of nature that cause damage to your lawn, but we will re-apply any areas for half of the contracted price. 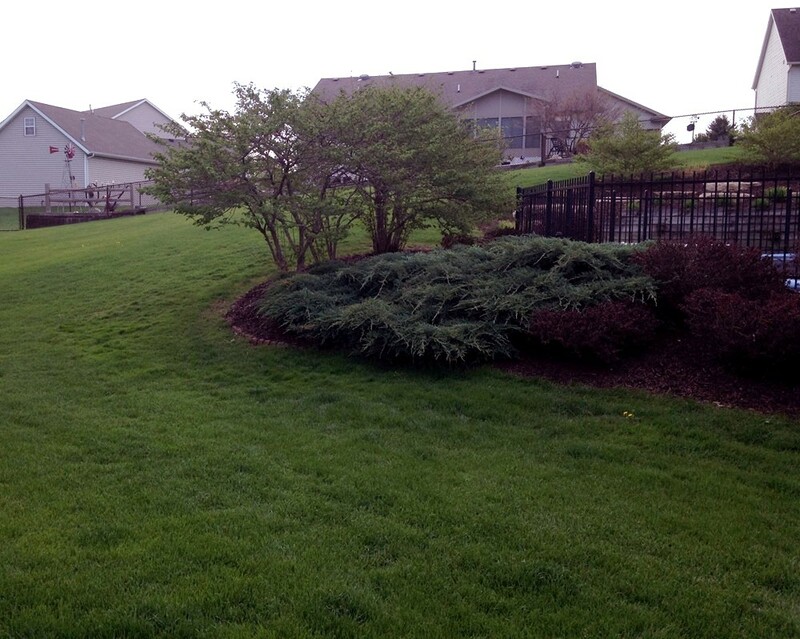 Please know that we are only a phone call away when it comes to the success of your new lawn, we care! Please call us at our office phone 616-878-9669 or email us at [email protected] to sign up for a maintenance program that fits your budget. “They only care about getting the job done right.” – Mike V.